Editors: Eckes, Suzanne E. and Russo, Charles J. 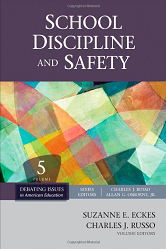 This volume in the point/counterpoint Debating Issues in American Education reference series tackles the topic of school discipline and safety. Chapters explore such varied issues as child abuse reporting, corporal punishment, student uniforms, zero tolerance policies, and more.